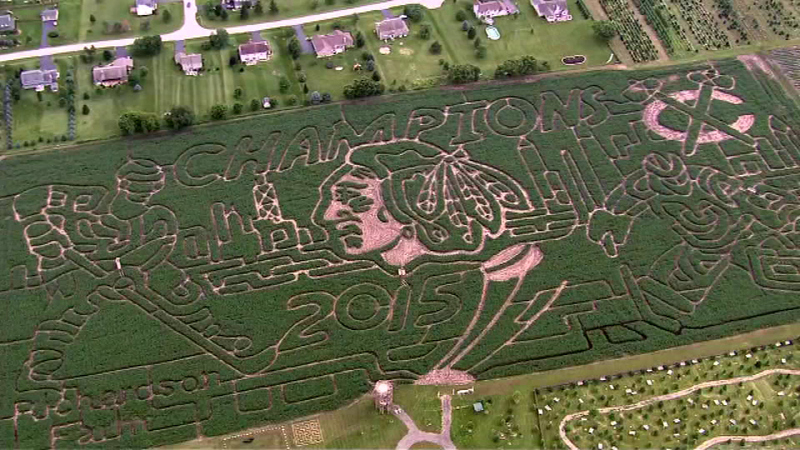 SPRING GROVE, Ill. (WLS) -- When Richardson Adventure Farm announced that the 2015 theme of the "world's largest and most intricate" corn maze is the Chicago Blackhawks Stanley Cup Championship, the news went viral nationwide. It's no wonder; Chicagoans love their Blackhawks, and it was the team's third Stanley Cup in six years. This is Richardson Farm's 15th maze, and it's bigger and better than ever, at 909 English Prairie Rd. near the small town of Spring Grove, a 60-minute drive northwest of Chicago. Over the years, maze themes have honored milestones for the Star-Spangled Banner, The Beatles, Boy Scouts, Girl Scouts and Military Veterans. "We're big Blackhawks fans," said Robert Richardson, one of the six family members who own the farm. "Originally the maze was going to mark the 150th anniversary of "Alice in Wonderland", but when the Blackhawks won...well, we just had to celebrate." Don't be intimidated by the 30-acre size of the maze. The design -- with the Blackhawks logo against the Chicago skyline, flanked by two hockey players and topped by the word "Champions" -- has many entry and exit points. You can explore a small portion of the nine miles of trails that comprise the design, or the whole thing. Maps are provided, marked with 24 corresponding "checkpoints" and three wooden "bridges" or viewing platforms within the maze. "No one's ever gotten lost," said George Richardson. "At least not for long. And no one's ever called 911." In addition to the maze itself, admission includes a 1950's carousel, wagon rides, pig races, giant slide, jumping pillows, pedal carts, spider web climbers, corn cannon, animatronic chicken show, five maze games and a 50-foot observation tower. There's a fenced area especially for little kids, with pedal trikes, barrel swings, slide, jumping pillow and a shelled corn cabin. New this year is a vintage "park train" that runs on real tracks and has seats big enough for grown-ups. That costs extra, as do the 700-foot zip line, zorb rides inside an 11-foot plastic ball, paintball gallery, gemstone mining, petting zoo, pumpkin patch and exotic animal show. Guests can enjoy two "community" picnic sites with campfires, or reserve private sites and bring their own picnics. The farm has concessions with food and beverages, plus stands with kettle corn, fudge and fresh donuts. And, the Richardsons have added plenty of brand-new "real restrooms with flush toilets and running water!" Group rates are available, and groups can reserve party space in a new barn, private picnic/campfire sites and private wagon rides. ADMISSION: $15 for teens and adults, $12 for children 4-12, free for children under four. Parking is free. See website for group rates and picnic/campfire reservations. FOR MORE INFO: phone 815-675-9729 or log on to www.RichardsonAdventureFarm.com.